"We are prone to judge success by the index of our salaries or the size of our automobiles, rather than by the quality of our service relationship to humanity." - Dr. Martin Luther King, Jr.
One last night in Africa. 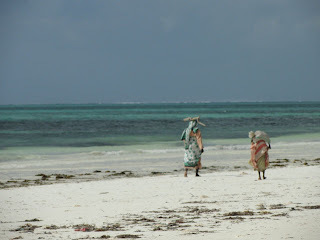 I spent the day reading on the beach and watching local women harvest seaweed in the shallows. This evening, after a champion grade packing session (in which I gave away most of the possessions with which I arrived), and one final and slightly successful attempt at sink laundry, I took a walk on the beach. I'm ready to leave Africa, for now. I'm ready to see friends and family, to sleep in my own bed and be woken, not by the call to prayer, but by Harper's wet nose. I'm ready for the joys of western toilets and refrigeration. I'm ready to get back to my "old" life and see how - or if - it's different now as a result of being here. 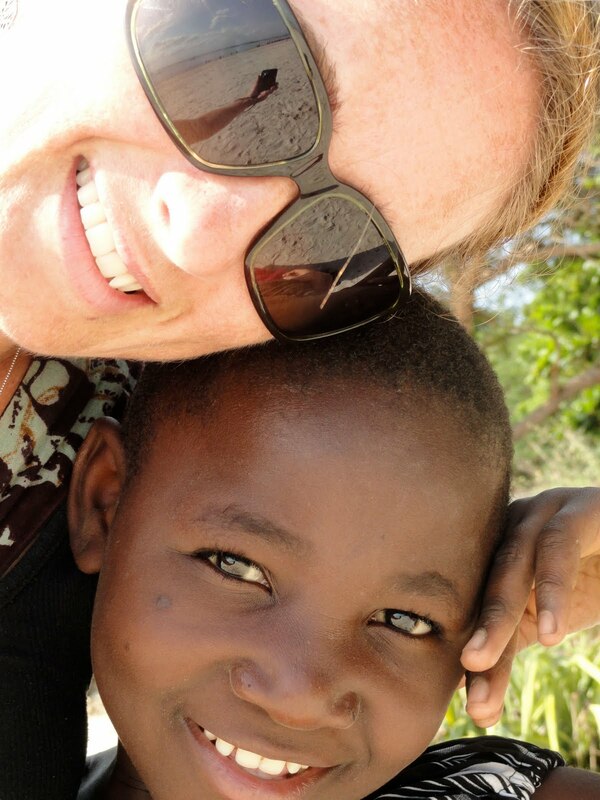 I've met many incredible people - Tanzanian and not. I've watched fishermen sail hand-carved dhows to shore with the day's catch. 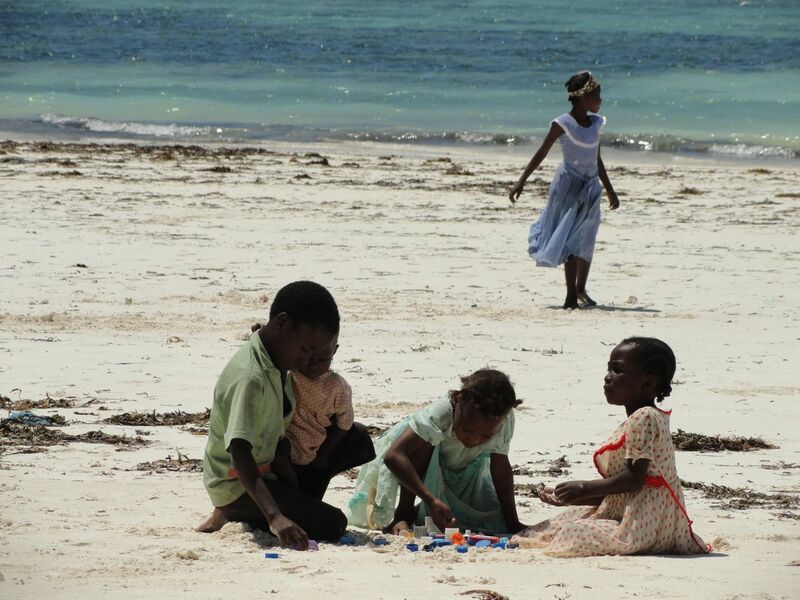 I've watched children play in the sand with the simplest of handmade toys. I've seen the sun set over Mt. Kilimanjaro and over the plains of safari. I've danced with the Chagga tribe in Moshi and celebrated the Full Moon with travelers in Kendwa. I've walked the streets of former slave traders and shed tears in the cells of slaves. 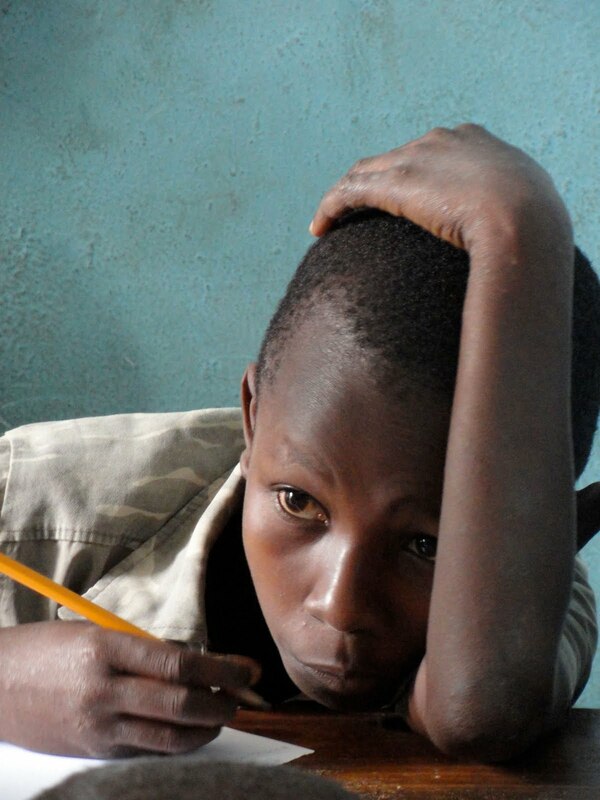 I've taught orphans to swim in the Indian Ocean and students to write in a school of crumbling walls. 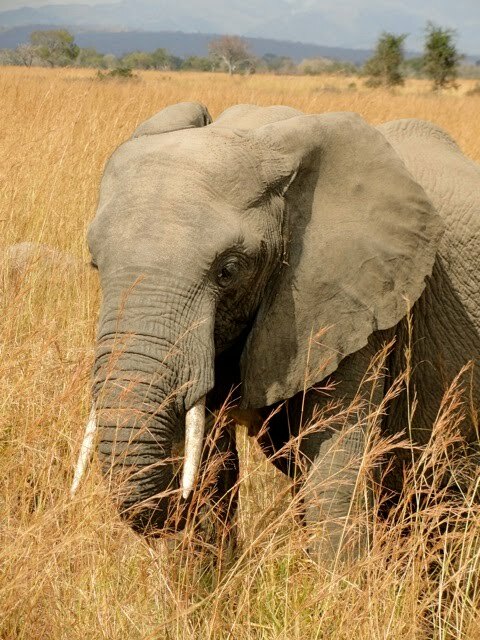 I've heard elephants trumpet a warning call to their young and seen a lion lunch on an unfortunate buffalo. I've wondered at the constellations of the southern hemisphere and marveled at the waterfalls of the Udzungwa Mountains. I've cried with frustration and exhaustion...and I've laughed with spontaneous and overwhelming joy. I'm leaving this place with so much more than I could ever have imagined. I came here with few expectations - only a hope to be a drop in a bucket. And, while I'm not certain just how large my "drop" has been, I am certain that a drop was made. The largest impact, it seems, has been on me. Who will I be as a result of having been here? Time will tell. I have found strength in myself that I didn't know I had; found joy that I thought had been lost; felt more lonely than I knew to be possible; and will grow from it all. I have a renewed faith in my own capabilities and in the inherent goodness of others. I believe in the indomitable power that is the human spirit. I believe in the universal languages of laughter, peace, and love...I also believe that, to have experienced it all, I am truly one of the luckiest people I know. Goats and chickens have right-of-way in the road. Humans? Not so much. A steady diet of carbs with a side of carbs is completely sustainable. It's normal for children to run out of houses and down the road toward you at full speed...then fling their arms around you - even if you've never seen that kid before in your life. Shower curtains just get in the way...a shower not only cleans you, but the rest of the bathroom, as well. Traveling alone is a situation that vacillates between quite lonely and quite empowering. It's growing on me! While it would be great to have someone to turn to when a thought or a new sight enters the picture, it's also great to be able to follow my own agenda. I've met some very nice people from all over the world and have very much enjoyed that aspect of my situation. In Arusha, I met Susanne, a German woman also traveling solo. We spent the day together wandering the frenetic and far from attractive streets of Arusha with Daniel from Ireland. After dinner that night, Susanne and I made plans to meet when we she arrived in Zanzibar, one day after myself. I can't say that I wasn't thrilled to leave the relative freezing cold north and fly south to the tropical island on Saturday. Zanzibar is so very unique. 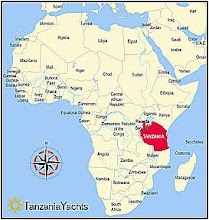 It has been used as a strategic port along East African trade routes for a thousand years and has seen its share of invasion, occupation, and rebirth. 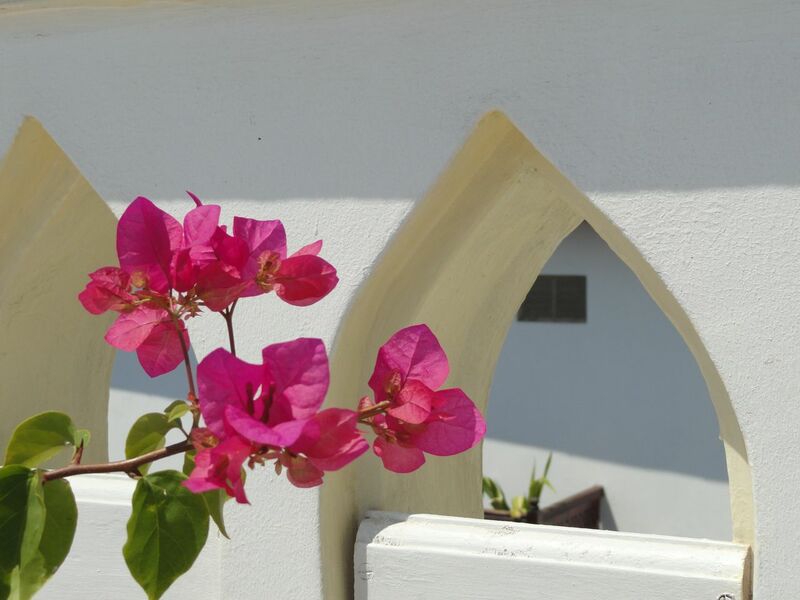 The largest city on the largest island of the archipelago is Stone Town, which comprises of narrow labyrinthine streets around centuries-old buildings, churches, temples, and mosques. The culture is a blend of African and of the Middle East, with a dash of Indian. The place simply oozes with romance, intrigue, and seems like it stepped out of 1,001 Arabian Nights. The population is 95% muslim, and I'm here during the month of Ramadan. Because it's a sought-after tourist destination and the place is crawling with Europeans, locals welcome our presence and even tolerate the cultural insensitivity of some barely-clad visitors. It is strange, though. Most restaurants are closed during the day and, at my hotel, if I want anything after breakfast, I have to take it in my room. I've become adjusted to the frequent calls to prayer from nearby mosques. After sunset and a brief quiet time when locals pray and then break their fast, the street food market and restaurants come alive again. I have spent the last two days wandering through the streets and seeing some of the historical sites. I went to the Anglican Church, a place built over an old slave market. 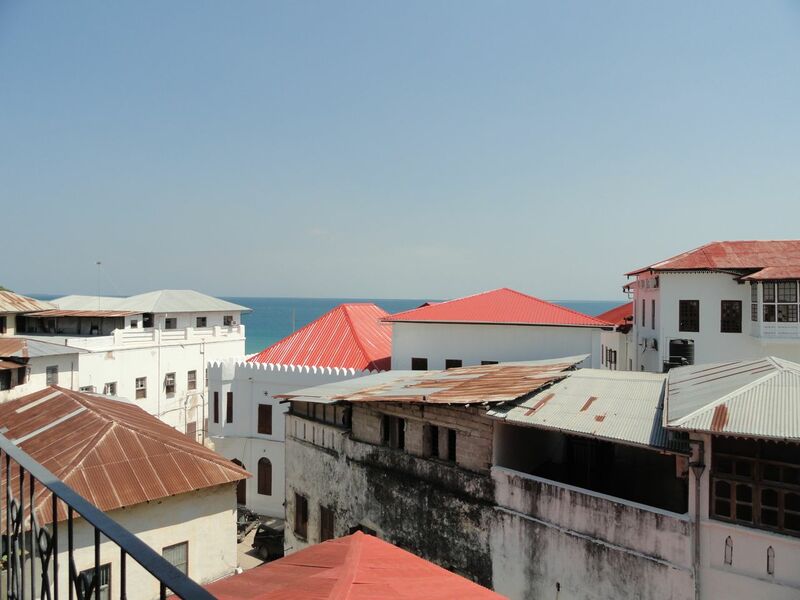 Zanzibar was the final African stop after leaving the coastal stop of Bagamoyo. From here, slaves were shipped to French-controlled Mauritius and other islands to work on sugar and spice plantations, or to Southeastern Europe. Inside the Anglican Church are markers where the well of the market, as well as the post to which human beings were chained before being sold once stood. It's beautifully done without being ostentatious and is moving to see. Underneath the church's neighboring building are dark stone rooms where, it is said, that slaves were kept prior to sale. The rooms are small with a raised stone floor. Being in them, one can only imagine the anguish and fear the walls once contained. Outside, there now stands a monument to remind visitors of Zanzibar's dark past. Stone statues of slaves are chained together with actual chain and neck manacles that were found in Bagamoyo. The place is silent, as it should be. 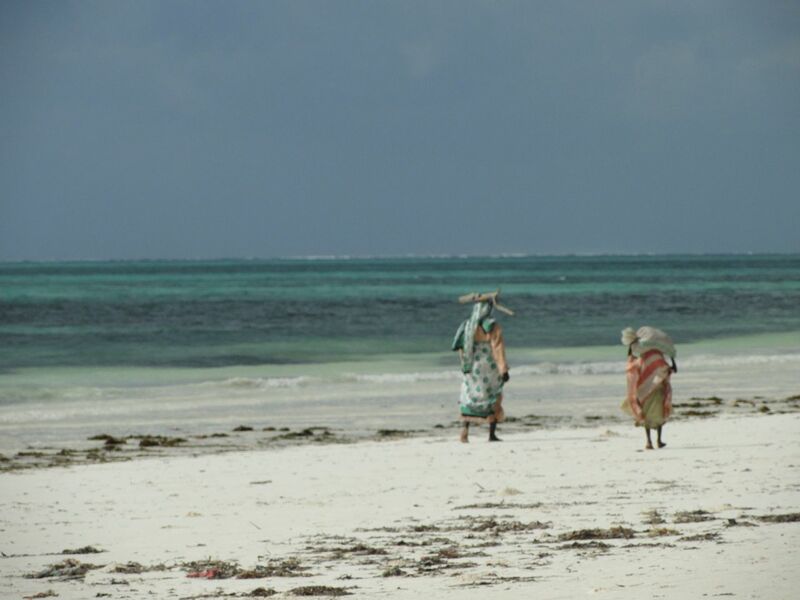 Zanzibar was also one of the first spice islands and a trip to a spice farm is another tourist highlight. I was able to see nearly every spice imaginable, including an iodine tree (I had no idea that the stuff is the sap of a tree), and ylang ylang (the stuff used in perfume), and ate fruits that I'd never heard of, let alone eaten! I had met a former volunteer for the tour and we stopped at the market on the way to buy a fish, which then was prepared for us for lunch after the tour. Incredible. 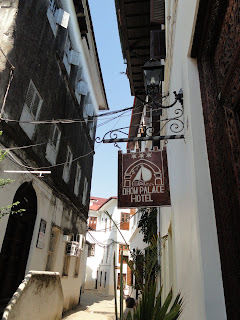 When I returned to Stone Town, I spent hours shopping down tiny streets, most too narrow for a car. I watched the sunset for the second time from the famous Sunset Bar, only seven kilometers as the crow flies from Bagamoyo, but entirely a world away with its luxurious middle-eastern fabrics draped on the walls and hookah pipes at every table. Last night, after Susanne had arrived, we decided to walk through the night market for dinner. Hundreds of stalls, all lit up by gas lamps and laden with fresh fish, fruits, breads, and meat skewers beckoned. Probably the best meal I've eaten so far in Africa...and all at a cost of about 4,000 shillings...or about $2.60. My hotel in Stone Town, the Dhow Palace, is a former mansion and is ornate in every sense of the world. While not a luxurious hotel, the carved furniture and antiques in the room and the open-air courtyard help to complete the experience. I'll be spending a few more hours here this morning before heading north to Matemwe, a quiet fishing village on the eastern coast of the island for my last nights in Tanzania. 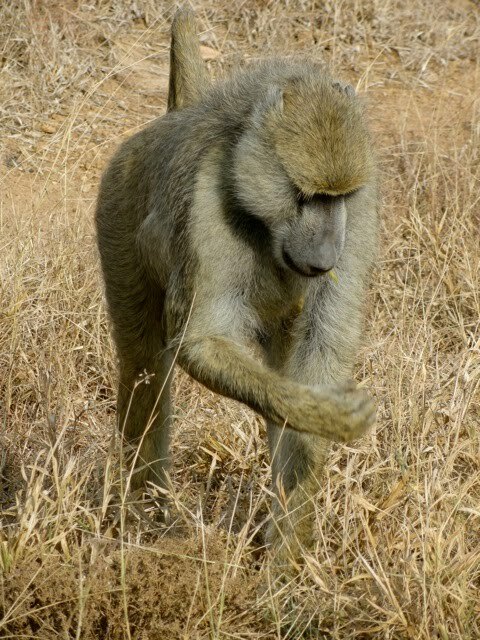 I'm hoping to hone my "do nothing" skills and finish my African adventure on a quiet note. On my last night in Bagamoyo, after a typical power outage, a group of us went down to one of our favorite local watering holes, Hill Side. The sign once must have said “Hill Side Bar” but the owner, wanting it to be of a higher caliber must have decided that, rather than buying a new sign, it would be easier to simply cut a hole in the sign where “Bar” once was. Below the entrance hangs another sign that reads, “The ultimate dinning experience.” It’s one of the nicest places in Baga and has its own generator, so is a likely spot when the power decides to take a break. After feeling our way down the street and finding a table, I enjoyed my last beer in Baga. Major came with his guitar and sang me a song. It was a perfect way to end my time there. Monday morning, after packing, breakfast, and one last trip to the internet café, I said goodbye to the staff and friends at CCS. As Kennedy drove me away from Bagamoyo south towards Dar, I felt a mix of sadness and accomplishment, knowing that the true goal of my trip had been accomplished. We went through what looked a lot like the poorer parts of Bagamoyo on a bumpy dirt road. Soon, I noticed an overpowering stench. This was the slums of Dar. What I had smelled was the dump. All around, huts and tiny stores were built on and around the refuse of the city's more than 1 million denizens. Children walked around barefoot and people went about their daily business as if it were normal because, well…to them it is. I was grateful when Kennedy’s reckless and fast driving bumped us through that area and back onto a tarmac road. We pulled up to the airport, I hopped out and shook his hand while another man grabbed my bag and motioned for me to follow him. It was at this point that I realized: Wait a minute. Kennedy just booked a 10 day trip for me, including airfare and he doesn’t even know my last name! Foolish, foolish Amber…this is Africa! After following the man through a rather haphazard looking metal detector, we arrived at a tiny waiting area and a small desk. A clerk shoved a piece of paper in front of me and instructed me to write my name. Ah yes…my boarding pass. The man disappeared through a set of double doors toward about five planes, all smaller than anything I'd been on in recent memory, with my bag. He returned a moment later, empty handed and motioned for me to sit. A few minutes later, the desk clerk shouted to the waiting area, “504 to Kili!” (504 is the airline name) and pointed toward an orange prop plane across the tarmac. I was too tired to care much that the 14 seater was rather old, and that I could see right into the cockpit. Nothing seemed to be duct-taped together and I wasn’t sharing the plane with livestock. That’s luxury. An hour later, I could see Kili rising above the clouds. We landed without incident and I was met by George and Phillip, owner of Mt. Kilimanjaro View Lodge. On our way from the airport, through Moshi town, and 9500 feet up the side of Kilimanjaro, Phillip kept me entertained stories of the lodge, the land, and of his tribe, the Chagga. He informed me that I was currently the lodge’s only guest. 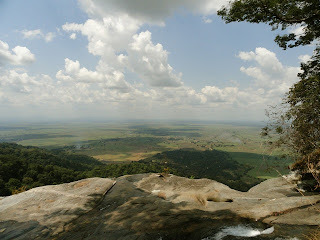 So, we climbed for about an hour before reaching the lodge’s gate, passing villages, maize fields, and banana trees. (The Chagga tribe numbers about one million people and, unlike the Masai tribe of the plains, its members are adept farmers; coffee, maize and bananas being their largest crops.) The staff greeted me like family and pointed out the glittering lights of Moshi, now far below. Being the only guest of a hotel is slightly awkward, especially when communicating with the staff, who speak Chagga language and Swahili, but very little English. So, with my limited Swahili and their limited English, our conversation was basic and marginally effective. There I sat, around a small fire with six Chagga tribespeople, communicating with a limited set of words, smiles, and laughter. They pulled out small drums and we sang until my tired eyes betrayed me. Three of them escorted me to my tiny dark hut where I wore about three layers of clothing to keep away the cold, and went to sleep. Waking up on Kili is cold, damp, and cloudy. All the same, it’s waking up on Kili. And, since I slept in nearly all of my clothes, getting dressed was relatively easy! After another conversation that established the making of food and my eating of the same, I met with my local guides for the day, Remi and John. We left the lodge and started downhill on the red clay road, passing Chagga people bent over, working in their fields. We walked through small groups of houses and a primary school before turning down one road and then another, to a narrow path that led over rickety log bridges and under avocado and banana trees. Eventually, we came to a beautiful waterfall, Mnembe Falls. At this point I, of course, was covered in the red clay mud while my guide, in leather dress shoes, was unscathed. After a few photos and a short break, we returned the way we had come, passing villagers who spoke quickly to me in Chagga language. John then took a hard right off of the path up a hill so steep that we had to inch our way along while ducking underneath the leaves of banana trees. Finally, we stepped up into the middle of a group of houses. An old woman came to greet us with a smile. She was Phillip’s mother. At age 101, she is frail but very strong. I was ushered into a small sitting area where coffee was served. I learned about the history of coffee growing in this region before they walked me through all of the steps of the coffee-making process, from picking the beans to finished coffee. I was still looking at my newly ground coffee (no push-button electric grinders here…instead, they use a large wooden pestle and mortar) when I heard drums. I looked up to see a group of women and one elderly man dance toward me. They formed a circle and invited me in. 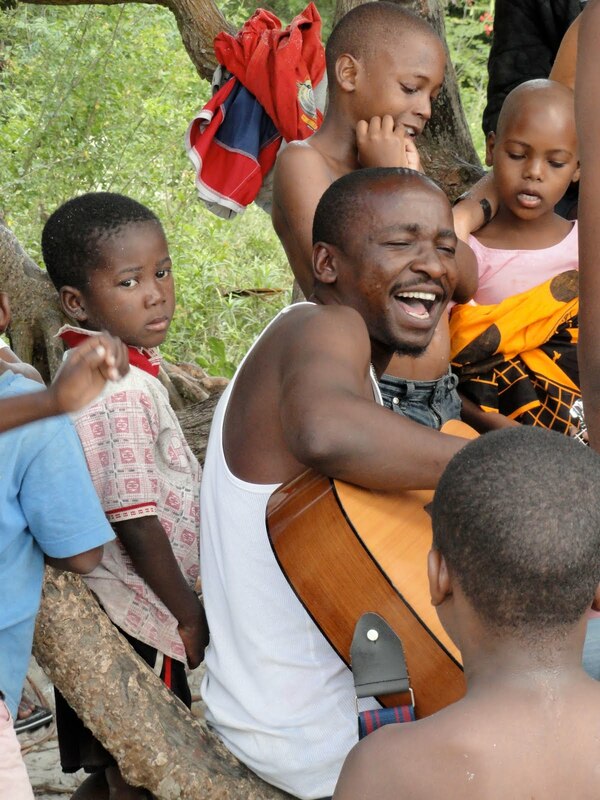 Soon, they were laughing at my attempt to sing and dance along…just another unforgettable African moment. We left the village and began the ascent back up the mountain to the lodge, passing other villages as we walked. We stopped once to try the local brew, a millet and fermented banana concoction. Through a dark doorway into a darker room lined with cardboard, the process was explained before a man appeared with a large plastic tub about the size of a large yogurt container. In the tub was a liquid about the consistency of thin Cream of Wheat. Banana brew. The tub was passed to me. I took one teeny, tiny sip and made it official: Banana beer is NOT my thing. John took the tub from my hands and downed the entire thing in about ten seconds. So much for not drinking on the job! After dinner, we repeated the songs around the fire. This time, the women dressed me in a kanga and renamed me “Amber Dada (sister), Queen of Kili”. I could get used to this. I awoke to yet another cold and damp morning on Kili…this time, cold rain fell. Packing to spend a month in the hot coastal region of Africa fell dramatically short when it came to preparing me for the chilly weather up here. After an enormous breakfast, I packed my bags and waited for Phillip to take me down the mountain. When I went back up to the main lodge, I met Walter, the cook. So, as Walter struggled with my heavy backpack down the slimy red clay road and onto a narrow path in his leather loafers, I baby stepped behind him in my hiking shoes, still slipping my way down. Twice he took a tumble in his purple LA Lakers pants and black leather loafers with my bag on his back. Twice, I said, “Pole sana”, feeling like a complete tool that this poor guy insisted on lugging my bag down a steep wet hill. We passed some of the other lodge employees on their way up the path, laden with boxes of supplies and food. I said goodbye to each of them and stood there awkwardly on the hill while they all argued in Swahili or Chagga over what I guessed was the distribution of my tip. Then, we continued our descent, passing waving children and women carrying wooden chairs or large bunches of bananas on their heads before finally meeting up with our car. This carried me down into Moshi, where we switched to another vehicle that drove me to Arusha, down another rutted dirt road past chickens and goats and busy people, to my next stop. So…here I sit at the L’Oasis Lodge in Arusha. I have taken a hot-ish shower under a real lightbulb (not a strategically placed headlamp) and am thrilled to be in a place where there is electricity all day long, rather than for only a few hours in the evening. I’m still freezing, missing the heat of Baga, and looking forward to the hot beaches of Zanzibar in a few days and my own bed, house, and hot shower beyond... It’s been a decidedly T.I.A. day. * Created and supports 16 full-time jobs for local citizens in a town where full-time, consistent work is difficult to come by. They are the office staff, cooks, housekeepers, drivers, and gate security for CCS. They have also been like family to myself and countless others who come to Baga. After working up to a 24 hour shift, they smile and greet us as if we've known them for years. Many are working on their secondary education and are able to get help from volunteers so that they, in turn, can better their own lives and support their families. 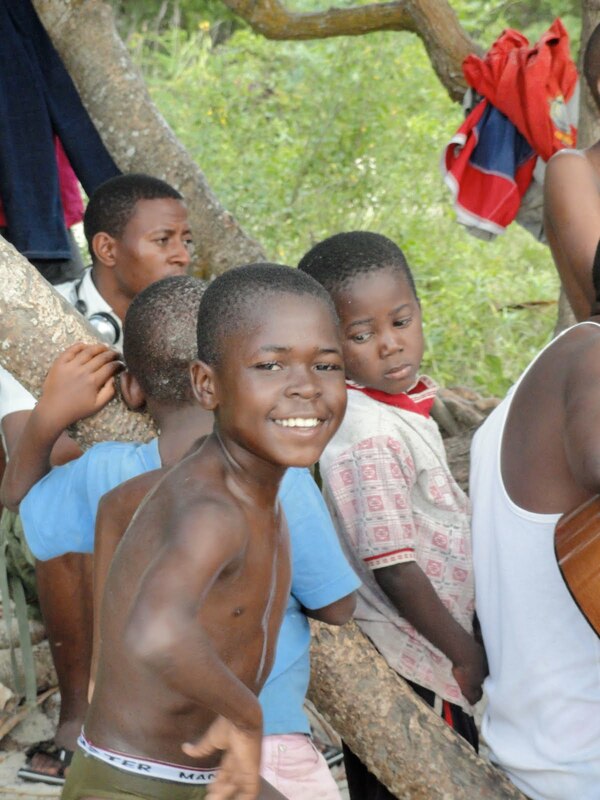 * Provided support materials for CCS's partner programs in Bagamoyo. While I was volunteering at Mwasama and Imuma, other volunteers were giving of themselves in local hospitals, HIV/AIDS centers, Red Cross, women's empowerment groups, small business development, orphanages and daycares as a result of what you have given. * Provided cultural exchange opportunities. Not only am I learning a great deal about local culture, I am also sharing my own. Through guest speakers, swahili lessons, and experiences with local artists, I will continue to be an ambassador of sorts long after my return home. To all who have supported me with an email, a hug, or a donation to CCS: You are remembered and appreciated each day. My experience here has been life-changing. I hope that you can tell by my blog entries just how much I have seen and done. Know that this experience, though, has been so much more deep, rich, and overwhelming than words can ever begin to express. What you have read is simply a drop. I will be forever grateful. Time has flown and my time in Bagamoyo is coming to a close. In four weeks, I've learned and seen so much. I've made new friends and terribly missed friends and family back home. I've seen things that break my heart and those that give me undeniable hope in the strength of the human spirit. I've learned that Africa is so much more than what western media leads us to believe. Africa isn't dying - it's perhaps more alive than anyplace on Earth. At our rather emotional final feedback meeting at CCS, Zik told us, "Thank you for coming here and giving of yourselves to help our country." I smiled and thought to myself that what it is that I may have offered this place is so very miniscule in comparison to what it has given me. I feel somewhat selfish, knowing of all of my blessings, material and non, awaiting my return at home and yet I will arrive home even richer for the things I have seen and done here. I'll leave here on Monday and catch a flight to the Kilimanjaro airport. There, I'll spend a few nights on the slopes of Kili at a lodge at about 9500 feet. I hope to hike a bit (no time, money, or gear to actually summit Kili - guess I'll have to come back!) and simply enjoy the view. Then, I'll spend a few nights outside of Arusha near some coffee plantations (I'm also hoping to sit in on a few of the Rwandan Genocide Trials) before flying back to Zanzibar. I'll be in Stone Town and do the historical and spice tours for two days before my final two nights on the northern part of the island at Matemwe beach. Then, I'll fly back to Dar in time to catch my flight back to the US. 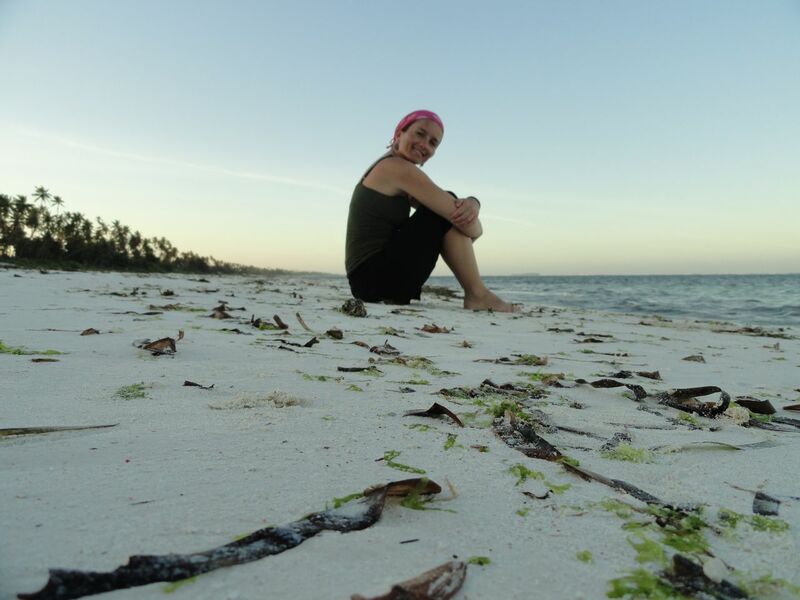 I'm looking forward to a new part of my adventure and time to reflect on all that the past weeks have meant, though leaving Bagamoyo and the people that I've grown to love here will not be easy. Because students were beginning a month-long summer break at Mwasama, my last day at the school was early this week. When tea time rolled around, teachers all gathered and placed the tables under the jackfruit tree together into one long table. Soon, cold glass bottles of soda were passed, along with chapate, sausage, and sambosa. It was my farewell party. While there had been times at Mwasama when I found myself frustrated at an education system so very different from my own and capable of so much, what I failed to realize was the impact that I was having through asking questions and sharing what I believe and how I teach. I don't pretend to assume that I've somehow changed the course of Tanzanian education in four short weeks, but I do know that I have done a tiny bit to share what I know with teachers and students here, as they have with me. So, as we sat beneath the tree and shared all that we've learned from one another, the teachers presented me with a kanga in thanks. I was so touched.Then, they all laughed at my inability to tie it correctly for some photos. Later this week, I met two Mwasama teachers, Godfrey and Kasanga for a drink. "You have helped us a lot, Madam Wembah. Many volunteers come and teach and then they go but they do not stop to learn. You stopped." With my eyes full of tears (that seems to be a theme this week), I accepted a beautiful batik of a giraffe in front of a mountain and a wooden makonde carving of two fishermen in a boat. I feel so blessed to have made such friends so far from home. During placement hours for the remainder of my days in Bagamoyo, I spent a little bit of time at AMAP (African Modern Arts Park), helping out in the preschool for street children there. I also spent a few days at Imuma, an orphanage and school for street children, orphans, and for those whose parents don't seem to notice. This was an altogether different experience than that at Mwasama. Down a rutted dirt road that shrank into a path between mud huts, the classrooms are tiny and across a small courtyard from a small dorm, office, and goat/chicken pen. Someone has accurately labeled the wood gate with chalk: "House of Goat"
Hannah, another volunteer who spent time here last summer and speaks somewhat fluent Swahili, explained to me how Imuma began. A local man had created a movie house of sorts and realized that the same kids came each day. Seeing the need for a place for these kids to go, to learn, and for some, to sleep, he created Imuma from his own funds. It's humble in the most accurate sense of the word, but is better than the streets. When my final day of volunteering came, we took the children of Imuma to the beach. Elias, the driver for CCS, drove us and the CCS Toyota van up to the path to Imuma. Children, screaming with delight, raced toward the open doors and piled in. I tried to count, but those climbing onto my lap obscured my vision. By the time the door slid closed and we began the drive to the beach, the van that usually holds 10 adults comfortably was host to roughly 40 children and six adults. 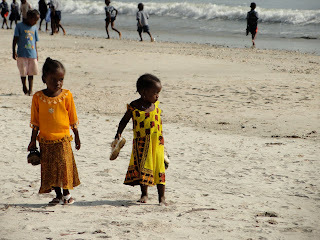 We were quite a sight, bumping down the roads of Bagamoyo, though not all that different from the packed daladalas that act as public transportation. After a similar screaming exit from the van, kids ran to the beach, ripped off their clothes (bathing suits are non-existent for these kids, so most swim in their underwear or in, well, nothing) and ran to the water. One boy grabbed my hand, said, "Swim?" and pulled me in. There I was, playing in the Indian Ocean with a group of children for whom clean clothes and a home are but a dream, yet they were so happy. I attempted to teach them how to float on their backs, taking each one in turn and supporting them while pushing them along. We cheered when they were successful and continued to try when not. Occasionally, a younger child would climb up into my arms and lay her head on my shoulder before being asked to be thrown into the water. As they grew tired, we worked our way up onto the beach where a group of kids had gathered under the palms. When I got closer I could see that Major, a musician and co-founder of Imuma, was singing and playing his guitar for the children. Kids sang along or watched from high in a tree. Some danced, some shouted requests for new songs. I turned, looked at the sun reflecting off of the water and watched kids laughing, swimming, playing in the sand, and singing. There are moments in life when one has to stop and catch her breath, and there are those that simply take it away. A year ago, had someone told me that I'd be sitting in an internet cafe, listening to swahili all around me, and watching a storm roll in while attempting to write a blog entry about going on safari, I'd have thought he was crazy. But, here I am. Now that I've been here three weeks and am somewhat adjusted to my surroundings, I have to stop and remind myself where I am and how incredibly unbelievable the entire thing is. 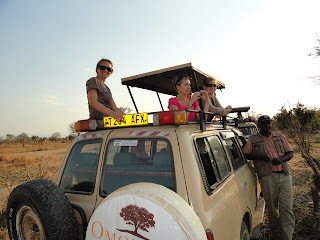 Going on safari was even more surreal. After growing up seeing animals in zoos or on Wild Kingdom episodes, seeing them in their natural habitat was surreal to say the very least. Thursday afternoon, Kennedy and our safari driver Sam, picked us up. Sam, a large teddy bear of a man with a warm smile to match, stood next to an old tan Toyota Landcruiser that looked as if it had seen a charging elephant or two in its time. Some of the black framework had been painted - with a brush, but it looked tough and rugged with its two spare tires on the back. I remarked that it seemed a tad excessive... (more foreshadowing? Yep.). He wore khaki trousers and a plaid shirt. Once the bags were in the car and all five of us loaded, he slipped on a khaki, multi-pocket khaki vest, gave us all a toothy grin and we were on our way. We traveled six hours, most of it on bumpy dirt roads, toward the central part of the country. Palms and coastal vegetation gave way to red soil and baobob trees. We passed through villages of mud huts, under the Uluguru mountains and passed the sisal fields (you know, the straw-like rugs from Pottery Barn). As the sun set, we traveled through Mikumi National Park and watched herds of impala, giraffes, and a few elephants from the highway. After turning off the paved roads and traveling up an impossibly bumpy dirt road in pitch black for two hours, we arrived at our stop for the first night, lit only by an occasional flourescent bulb. The Twiga Hotel, while in a beautiful setting, was anything but restful. Knowing that it was one night, we all sucked it up, looked past the ants, tucked in our mosquito nets extra tight, and enjoyed our first look at television (albeit in swahili) in three weeks. Needless to say, it wasn't the best night of sleep ever. With the morning, we were excited to begin our hike through the Udzungwa mountains. Along the 6.3 km hike, we saw a variety of monkeys and medicinal trees (including one that, according to our guide, "Is like Veee-agra. So to give energy to your friend." After passing a large pile of dung, our guide nonchalantly informed us that there were elephants in these mountains, along with leopards and deadly mamba snakes. Awesome. Luckily, the fiercest thing we saw were the long and wide stripes of soldier ants, carrying eggs through the forest. After passing two waterfalls, we came to a cliff that overlooked a lush green valley below. This was the top of the highest waterfall in the park. 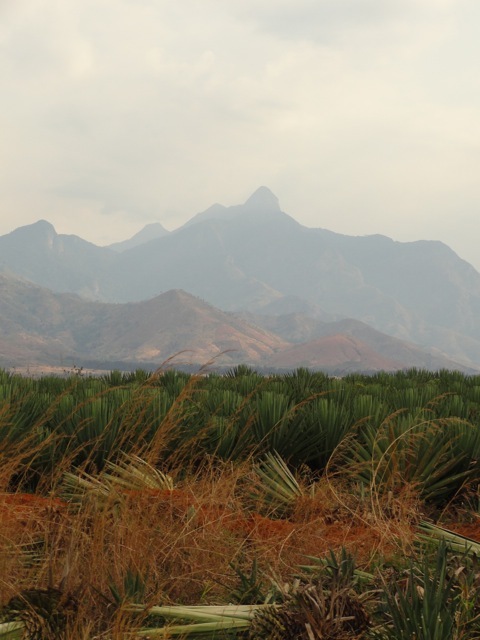 Sugar cane fields stretched as far as the eye could see, along with smoke from small villages and small bunches of trees. We sat, at the top of the 590 foot waterfall and took in the magnificent view. Pictures simply can't do it justice. Once we descending the mountain, we had lunch in a small village, and drove back into Mikumi. We arrived just after dark at our tented camp. I wasn't sure it was possible to be darker than Bagamoyo, but the camp's generator was the only power for miles around. Tiny lanterns dimly lit the walk and one could make out the thatched-roof main building. A tiny woman, in her sixties and with a charming South African accent, called up to us and we went in to register. She explained a few ins and outs, and sent us down a stone path to our tents. The tents were actually hung on top of a wood-planked raised deck, under another thatched roof. Each tent contained two beds, a full bathroom, and all of the accoutrements of a normal hotel room, minus the solid walls. It was beautiful and a welcome treat. Two words: hot shower. My first since arriving in Africa. Heaven. We ate a wonderful dinner involving the absolute luxuries of real butter, dairy, and chocolate mousse, before moving to an open deck where we could hear the call of a bushbaby (a small, large-eyed primate) and the shine of a flashlight revealed one in a nearby tree. Charles, one of the proprietors, explained that they would eat out of your hand. He grabbed some dinner rolls, called them over, and we watched as they fed just a few feet away. The generator would be turned off at 10:30, so we left the dining area and were escorted to our rooms by a masai in full costume carrying a lantern. While the bed was comfortable, the night was cold and full of very strange noises. We were staying inside the park, so this was to be expected if not comical. Early Saturday morning, after a breakfast including another first in three weeks, real (not from powder) coffee with real cream, we met Sam and his vest, piled in the Landcruiser (now with the roof raised for viewing) and bumped down the hill toward the plains of the park. 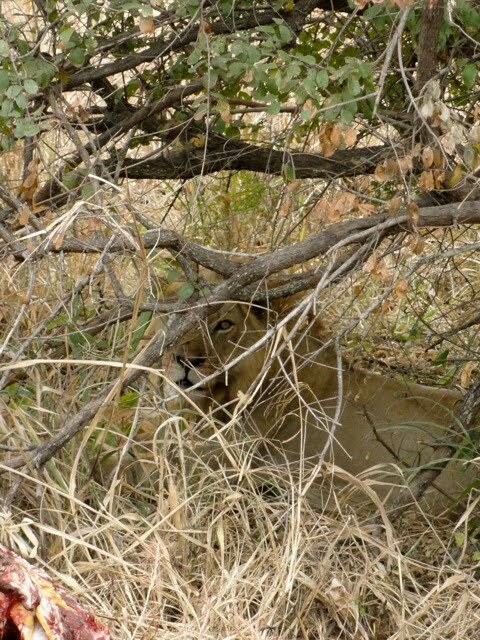 After seeing giraffes, elephants, ridgebacks, impala, buffalo, wildebeast, and warthogs, we had still not seen the elusive lion. We called out "Simama tafadhali!" when we needed to stop and take a photo, followed by "Tunaweza kwenda!" when we were ready to continue. Each time we passed another safari vehicle, Sam would stop and discuss progress. It sounded something like, "swahili swahili swahili hapana (no) swahili swahili swahili simba (lion)." Thinking that we wouldn't be able to find one, we moved toward the main gate to take a break for lunch. Sam stopped the truck near a beautiful tamarind tree. Thinking that it was a rather nice looking tree, I pulled out my camera to take a picture. 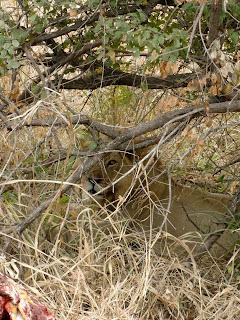 Now, I looked and looked and looked, and I was pretty sure that I saw no lion, but Sam insisted, backed up the truck and turned off of the road toward the tree. 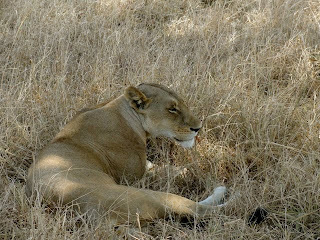 The two females lounging in the shade under the tree came into focus as we drove the truck around them, not ten feet away. In no time, other vehicles arrived. We returned to the road and watched as some people, completely oblivious to the obvious danger, got out of their vehicle and allowed their young child to walk around before the drivers yelled at them to get back in their car. Sam was the hero of the day, receiving grateful slaps on the back from other drivers, knowing that their tips had just risen dramatically. We cheered him on as we left for lunch, him smiling in his safari vest. We took another sunset game drive that afternoon, this time viewing hippos, crocodiles, birds, and baboons before dinner. On Sunday morning before heading back to Bagamoyo, we took one last game drive and saw all of the animals we had the day before. Again, the lion was elusive. So, we went back to the main gate, took some final pictures and were about to load into the car. "There is male lion. Eating lunch." "Yes. A buffalo was killed by a truck this morning. I saw it. Drivers had already cut off its legs for steak. Now, a male lion is eating." "Well, what are we standing around, taking pictures for??? Let's go!" Once we arrived at the rather gruesome sight, we saw him. He was resting in the shade of a nearby tree a few feet away from the unfortunate water buffalo, more majestic than anything I've ever seen. The king of the jungle. Words simply aren't enough. Vultures circled overhead and landed in nearby trees. 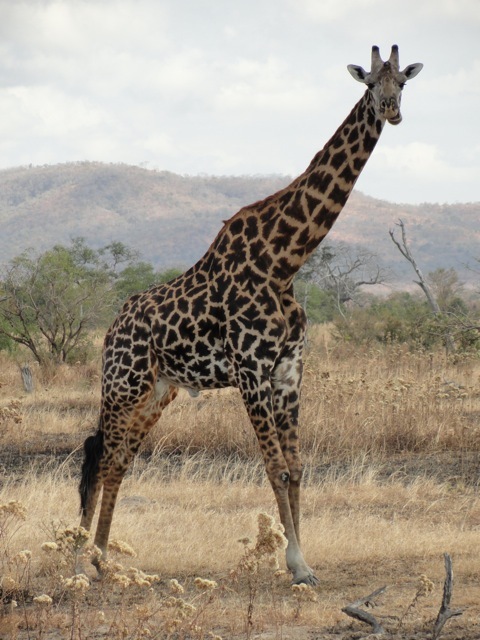 He wasn't too active, however, and we watched him for about 30 minutes before heading back toward Bagamoyo. Sam slowed at one point to warn some drivers near a broken down truck that there were lions nearby. He entertained us with stories of how many truck drivers are attacked and killed by lions in the park each year. The trip home was rather eventful. We needed both of those spare tires. The first was replaced in a tiny village. While we stood near the truck, the villagers all came out to watch Sam change the tire and to stare at us. I was able to talk a little bit with a few children. Most were shy, but one little girl and her stunning shy smile took my heart. When Sam was finished and we went to load into the car, I gave each of the kids a fist pound or a high five and took my seat. The little girl ran up to my half-open window, stood on her tip toes and reached her hand toward mine, saying no words. I gave her another high five, said "Baadaye!" and watched as she smiled from ear to ear and returned to her friends. It was one of those moments, miniscule and larger than life at the same time. After returning back to Baga to the open arms of the CCS staff and to a new group of volunteers, I fell into bed exhausted and reviewed the weekend with another of my bulleted journal entries so that I could remember it all. And, while I'll always remember the beauty of the animals and of the savannah, stretched out as far as the eye could see and dotted with the silhouette of giraffes, elephants, and others, I'll never forget driving through the bush. Smiling at children, running from their mud huts and waving excitedly at us, watching kids playing soccer with a homemade, lopsided fabric ball, seeing the bicycles laden with rice or containers of water or the women, carrying children and rice and water all at once...but most of all, the children and those heart-stopping smiles. That's the stuff of Africa. Someone once told me that Africa has a way of hooking you when you least expect it and, once hooked, it never leaves you. I think I'm there. Bagamoyo is a small village north of Dar es Salaam on the coast of Tanzania. Copyright Amber McLellan 2010 All rights reserved.. Watermark theme. Theme images by Cimmerian. Powered by Blogger.